I'm trying to track down the name of a graphic novel from my childhood but unfortunately have few memories of it. It was a hard back thick book that was published by 2000ad (I think) with a science fiction theme and one particular part I remember is as a punishment a guy was tied to a poll high in the air and creatures were flying round him and they would only attack when he fell asleep. Not much to go on i know! 2000AD hasn't published any graphic novels, apart from reprints of things that first appeared in the prog (only exception I can think of is Judgement on Gotham, published in concert with DC comics). as a punishment a guy was tied to a poll high in the air and creatures were flying round him and they would only attack when he fell asleep. Hmmm, sounds a bit like "Stranger in BrexitLand" possibly? Or maybe "Last Referendum in Preston?" Hey LTP, we like a good puzzle round these parts! Rings the faintest of bells, but maybe I'm thinking of the airborne rats of the Cursed Earth. Perhaps we could narrow it down by telling us when your childhood was? Don't mind this lot, there have been all sorts of 2000AD hardbacks over the years, many of them claiming to be graphic novels. Can't have been too many GNs or trades in the 1970s, certainly not from IPC/Fleetway, and certainly not hardbacks. Was the pages black and white or colour? Can you remember the colour of the cover? I'm imagining it could be the Titans, stiff card covers easily mistaken, or if the OP is younger, the deluxe B&W HBs of Dredd, Slaine etc of the early 2000s (which were, after all, nearly two decades ago). Or even an annual! I'm imagining it could be the Titans, stiff card covers easily mistaken, or if the OP is younger, the deluxe B&W HBs of Dredd, Slaine etc of the early 2000s (which were, after all, nearly two decades ago). OP's query immediately made me think of the chap in Sky Chariots who gets tied to the crow's nest and subsequently devoured. Sky Chariots was the first thing that I thought of too (discounted due to the time period, sci-fi and sleep bits). When was the first reprint of Sky Chariots, anyway? The only 1980s Slaine collection I ever saw was the Diceman stories. Cursed Earth combines some elements (Judge Jack tied to a pole, Devils Lapdogs, though can't think what the sleep bit is all about). It's not that Conan thing with the vultures that Garth Ennis ripped off years later in that 'Goodnight Kiss' Dredd story, is it? Apologies I didn't receive any notifications on your answers. I will have read it around 1982 in the children's section of my local library. It was colour print but the covers were black, it was A4 and quite thick. The feeling I have looking back is a science fiction setting but with some medieval weapons like swords. A bit like Flash Gordon maybe. Thank you for your suggestions I'll do some research. Could be "The Trigan Empire"? Pyroxian, you could be onto something there....just done the usual Google images search and found the below panel. 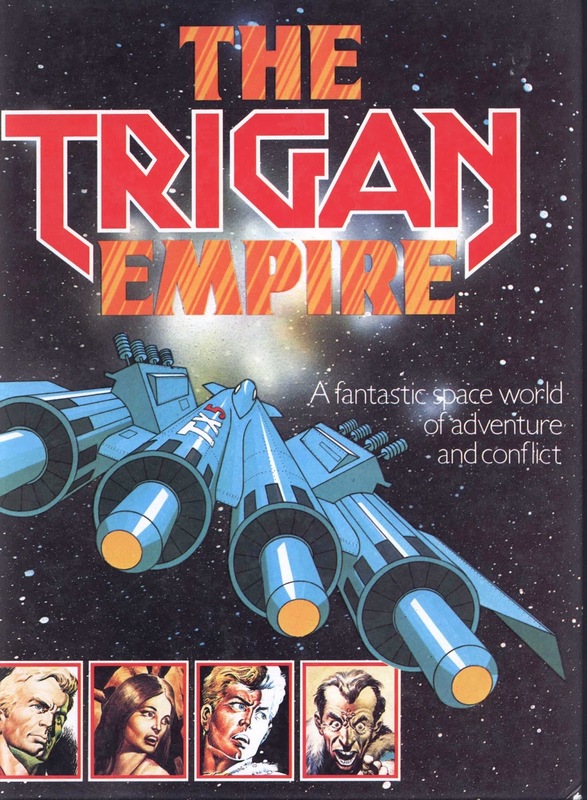 Now want to read The Trigan Empire myself as it looks amazing. Good job Tharg just bought the lot, so! Looks like it narrowly made it from Look and learn stories!